“The Hurt Locker” wins for best picture, its sixth Oscar of the night. Kathryn Bigelow, the director of “The Hurt Locker,” becomes the first woman to win an Oscar for best director. Only three women were nominated previously: Lina Wertmüller, “Seven Beauties,” 1976; Jane Campion, “The Piano,” 1993; Sofia Coppola, “Lost In Translation,” 2003. Sandra Bullock wins her first Oscar, for best actress in “The Blind Side,” beating out the other co-favorite, Meryl Streep. Ms. Bullock now has achieved a Hollywood first: she become the first actor to win an Oscar and a Razzie in the same year. “The Cove” wins the Oscar for best documentary feature. Shocking absolutely no one, “Avatar” takes the Oscar for visual effects. Joe Letteri, Stephen Rosenbaum, Richard Baneham and Andrew R. Jones accept the award. After a very long dance performance, the Oscar for best original score goes to Michael Giacchino for “Up.” It’s his first Academy Award. “Avatar” picks up some ground against the “The Hurt Locker” by winning the Oscar for best cinematography. It’s Mauro Fiore’s first Academy Award. Tom Ford and Sarah Jessica Parker, well-known fashionistas, hand the Oscar for best costume design to Sandy Powell for “The Young Victoria.” It’s her third Oscar. “Avatar” picks up its first Oscar of the evening, for art direction. The winners are Rick Carter and Robert Stromberg (art direction) and Kim Sinclair (set direction). A very emotional Geoffrey Fletcher, the screenwriter of “Precious: Based on the Novel ‘Push’ by Sapphire,” wins his first Oscar, for best adapted screenplay. Joachim Back and Tivi Magnusson win the Oscar for best live action short for “The New Tenants,” which stars Vincent D’Onofrio. 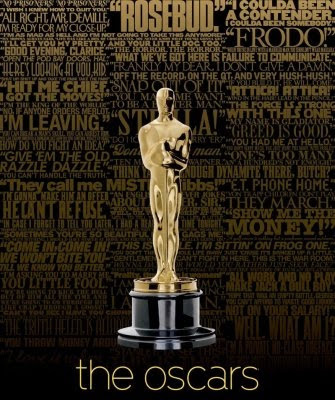 “Music by Prudence” wins the Oscar for best documentary, short subject. “The Hurt Locker” gets its first Oscar of the evening, with Mark Boal, journalist turned screenwriter, winning for best original screenplay. Pixar continues its dominance of the Oscar’s animated feature category with the victory by “Up” in a very strong year. As expected, Christoph Waltz, the silkily villainous Nazi in Quentin Tarantino’s “Inglourious Basterds,” won the Oscar for best supporting actor.